Today I set about trying to solve the failed 6x 12v lights in our patio awning. 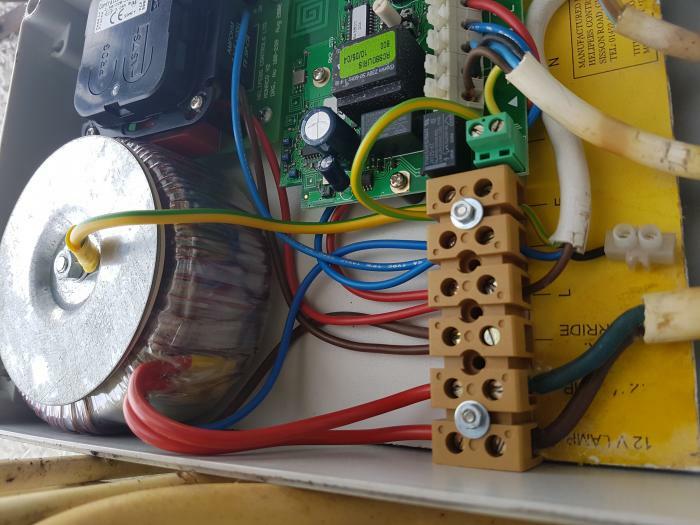 In the control box there is a circuit board for the electric motor to drive the awning in and out via a remote. The is separate Somfy box which as far as I can tell is the receiver and relay for the 12v lights with a separate Somfy remote setup to it. I believe the receiver (black box, top left of photo) has given up - there are no LEDs flashing on it when pressing either button to programme or test it. I've had it completely apart and re-flowed all of the solder points on the main board (not the micro PCB with tiny components on) but no joy. Now, I need educating...; there is what I think is a toroidal power transformer to step down the voltage to 12v. The wires I have traced to the 12v lamps are very thick - much thicker than anything I've seen for household lighting. The wires that take from these thick wires to the lamp holders are very skinny (as expected for the application). Is it something to do with them being halogen? I think I measured the voltage going through this wire at way more than 12v - I can't remember correctly. Perhaps is was 72v (12v x6 bulbs?). To me (with limited lighting experience) this seems very oversized. Can anyone advise why this maybe? 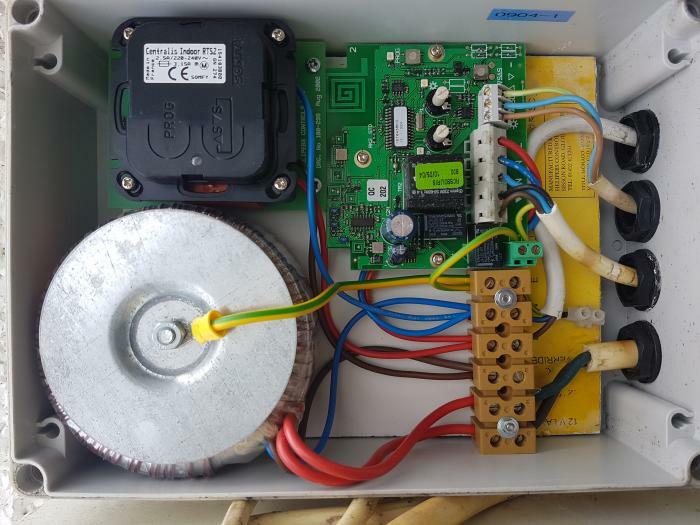 The current is likely to be quite low - why not just use a simple compact 12v electronic step down transformer (this awning was made in around 2005 or so)? My plan is to now change the bulbs to G4 LED and install a 36w LED driver and wall switch as we do not really need the remote control facility. Many thanks for any comments. 12v halogen lamps draw a lot of current which is why the cables are "thick"
"Standard" 1mm lighting cable is only rated at almost 10A so it is not suitable since it would soon over heat and melt. I would check the voltage again, but bear in mind the transformer output is AC NOT DC so make sure your meter is set right. Thank you. That makes sense then. These are only 20w but I get the point. LEDs all the way from here then!